Registration update: We’re at capacity, but the waiting list is open. Thank you to everyone who already registered for An Evening with Roshi Joan Halifax. The response has been overwhelming, and we are now at capacity. We have started a waiting list. Wait list check-in will begin at 6:50 pm, on a first-come, first-served basis. At our last public event, many people from the waiting list were able to be seated. An Evening with Roshi Joan Halifax will be going on as planned - Rain or Shine! 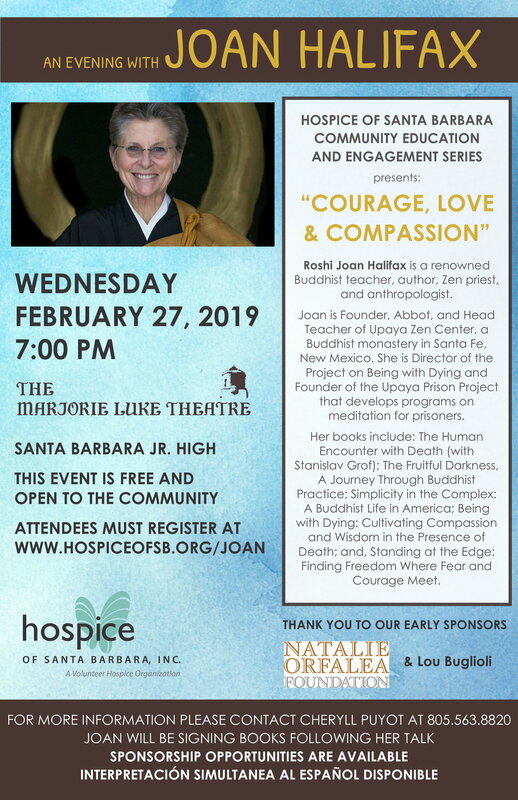 Join us February 27, 2019, where we look forward to welcoming you at The Marjorie Luke Theatre as Hospice of Santa Barbara presents: Compassion, Courage, and Love. Thank you for your patience as HSB has been monitoring the weather forecast. The Marjorie Luke Theatre offers free, unlimited, off-street parking. There are 110 spots in the main lot off of Cota Street. When that lot gets full, parking will be available in the basketball court area. An attendant will be present to direct you. Please allow sufficient time to park. Attendees are encouraged to bring their copy of Standing at the Edge: Finding Freedom Where Fear and Courage Meet. Books will also be available through Chaucer's Bookstore for purchase at the theatre. Registration will be right outside the theatre doors. Registration will be divided by 6 tables - Sponsors (Bright Star and above) / Shining Light Society & Reserved Seating, A - E, F - L, M - S, T - Z, and Wait List. It is required to check-in with one of our HSB staff members and volunteers. No video, photography, or recording of any kind is permitted. Roshi Joan Halifx speaks about her new book: STANDING AT THE EDGE: FINDING FREEDOM WHERE FEAR AND COURAGE MEET. View this video below.